Hello Babblings & More readers. I'm Leslie from Try To Keep Up! and I'm so excited to be guest blogging here at Babblings & More. I'm a Dance Teacher/Choreographer by trade with a Bachelor of Fine Arts in Dance (I'm fancy huh? ), but I've always been a crafty gal. Over at Try to Keep Up! you'll find a whole smorgasbord of stuff - holiday crafts, home renos & DIYs, photos of my latest trip but what I'm infamous for is my homestyle recipes. I love to cook and experiment with new recipes. 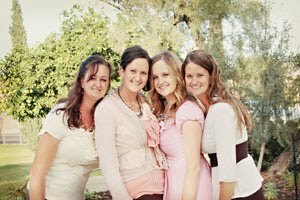 I've only been blogging seriously for about 2 years - mostly because my sister Jill started a blog (Envirocraftiness) and I couldn't let her have all the attention. You can find and/ or follow me on my blog, Facebook, and Pinterest! What can I say, I get around? I do hope you'll stop by and have a peak at some of my misadventures in cooking & crafting! I feel like I'm always trying to keep up, hence the title of my blog, Try To Keep Up!. Today I wanted to share with you a really great pork recipe that's guaranteed to change your mind about what pork is capable of! This is a fabulous go-to dinner and is a simple way to impress your guests. 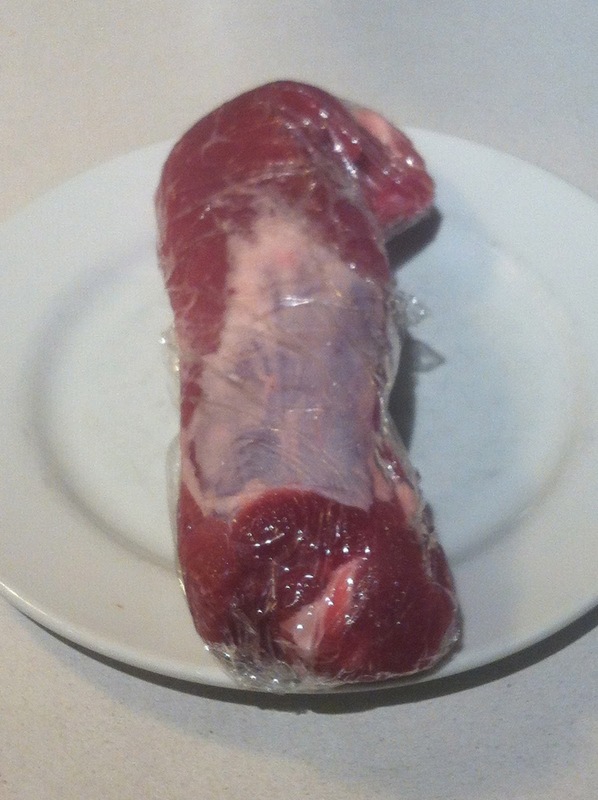 I buy my pork loin at Costco. It comes 4 tenderloins to a package and they're pretty much ready to go. If your pork is frozen make sure to thaw it overnight in the fridge or if you're like me, and never decide what to have for dinner the night before, take it out in the morning and let it defrost on the counter! Clean up and remove any silver skin you don't want. Keeping some fat is always good for two reasons 1). Fat is flavour and 2). Fat is moist. 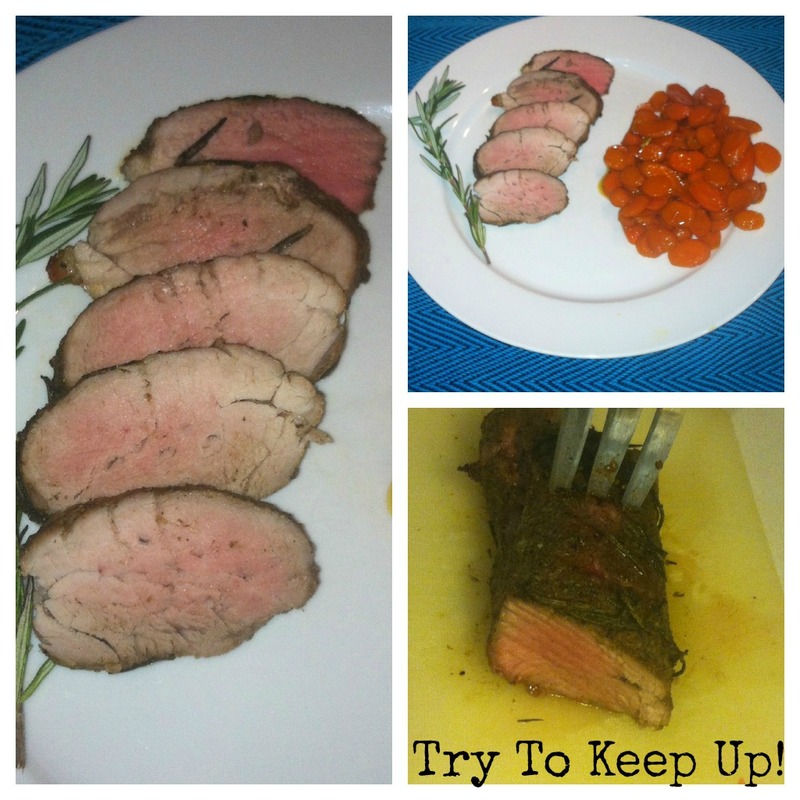 Keeping some fat on any cut of meat will help it retain moisture! 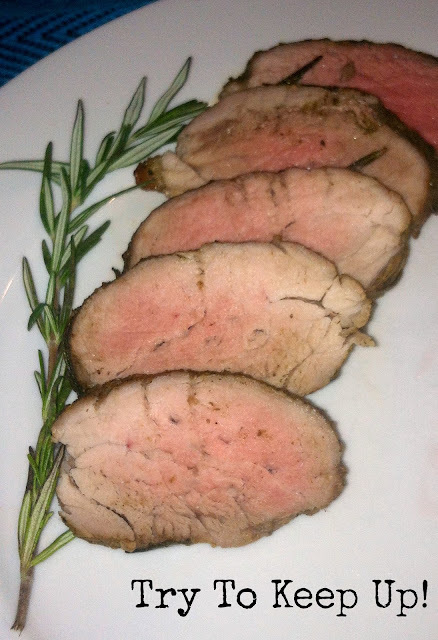 It's your choice whether you keep the tenderloin whole (which I usually do) or you can cut the tenderloin into medallions-this is nice if you're having guests and want to appear fancy. This will also speed up your cooking time, since medallions are smaller. 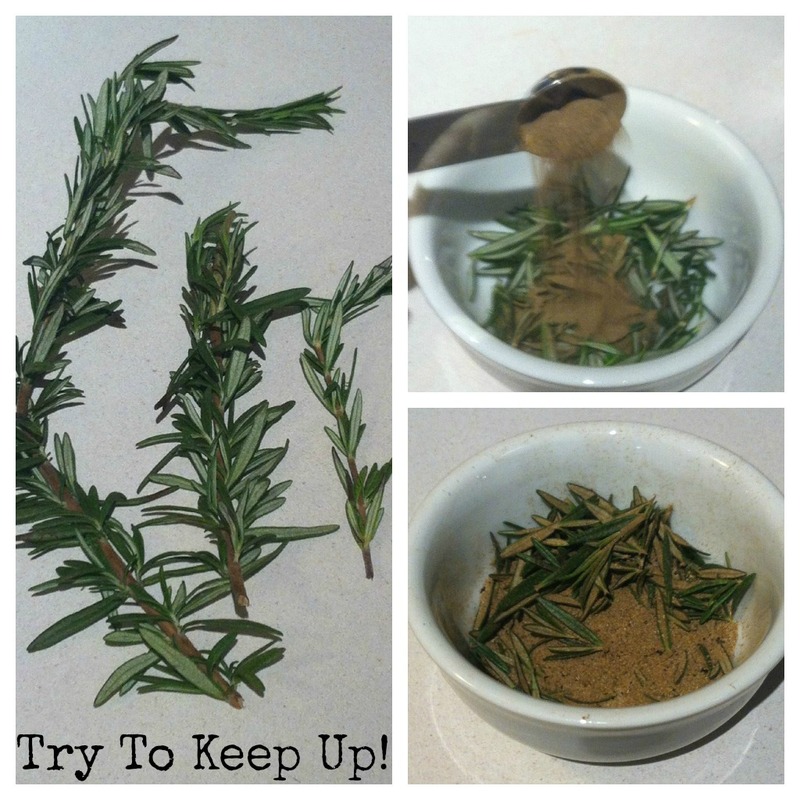 Combine 2 tsp dried thyme, 1 tsp onion powder, 1 tsp garlic powder, 1 tsp salt, fresh cracked pepper, and fresh or dried rosemary. This time I had fresh rosemary in the fridge so I used it. It's just as good with dried rosemary (I buy mine from Trader Joe's!) Also if you don't have onion or garlic powder use onion salt or garlic salt. Just make sure to omit the salt from the original recipe. 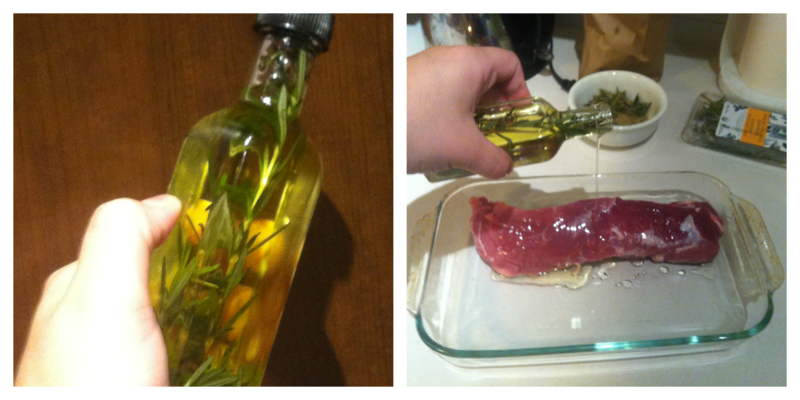 Next drizzle your tenderloin with olive oil. I made some rosemary infused olive oil a few days ago so I used that. Bake the pork for as long as necessary. Mine was still pretty frozen so I ended up baking it for about 35-40 minutes. And I know what a lot of you are thinking... "Leslie your pork sure looks pink. Aren't you supposed to cook pork well?" Well, I'm here to tell you that's a bit of a myth, an old wives tale if you will. If you (in my opinion) over cook your pork so it is grey throughout you will end up with a tough, dry piece of meat that no one wants to eat. Cook until it's slightly pink in the centre (mine looks really pink but that's just the picture) and let it rest out of the oven 5-10 minutes before serving. Like Anthony Bourdain says "Always rest your meat" Whether it's steak or pork let the meat rest - it keeps on cooking even though it's not in the oven. I served the pork with glazed carrots. It is really versatile and will work with just about anything. Green beans, broccoli, spinach....oh and any grain. We had a late dinner - I didn't think it was a great idea to have carbs after 8pm. I promise you this is a great, fail safe dinner that's quick, easy and scrumptious. 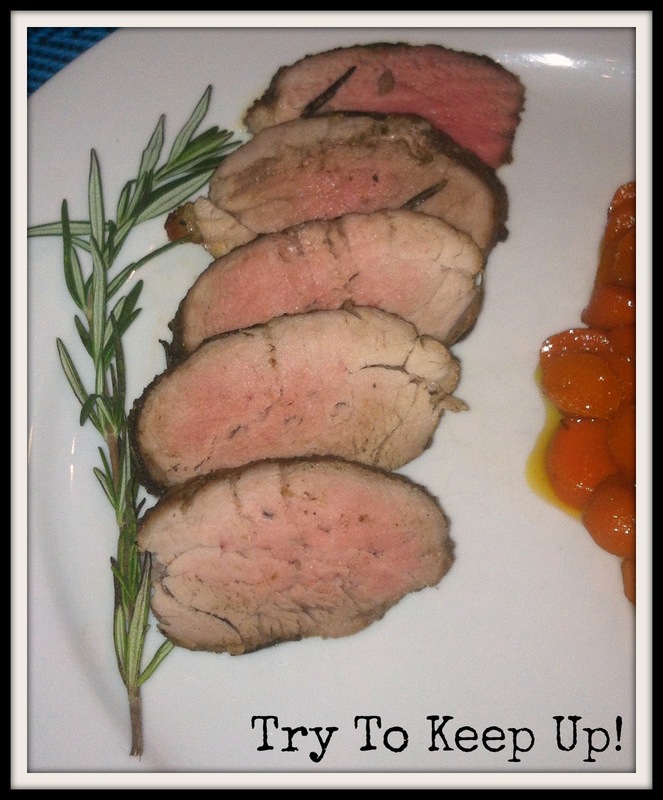 I hope you enjoyed this recipe and if you did, stop by Try to Keep Up the next time you're searching for a quick and easy meal. I've got my favourite macaroni casserole, chicken , fish, an awesome zucchini casserole, and so much more. And before I go, just another big shout out to the lovely ladies at Babblings & More for having me guest post today! It's been a blast-thank you thank you thank you! Thank you Leslie! My mouth is seriously watering! I love pork!